Kyle is joined by Adam of The Monster Project to talk in great depth about his amazing Godzilla music CD. Do yourself an favor and check it out! This particular episode (episode 41) may just go down as one of my favorites. Why, you might ask? 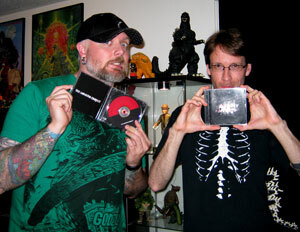 Because our guest tonight on the Kaijucast is Adam Alexander of The Monster Project! What’s that? You haven’t heard of The Monster Project, you say?! You are in luck, sir or madame as the case may be, because not only does Adam talk about the CD he created, we also play two of the tracks on the show… and, if that’s not enough, you can always check out his website to hear the whole thing for free. Now, even though you can listen for free, I really, really hope some of you buy the CD because (and this harkens back to my love of DIY projects) Adam and the rest of his septet made this! Blood, sweat and tears and all that. If you want to hear more from the project in future episodes, I will be happy to oblige. I also need to mention that while we don’t have any real Godzilla news, I do have some thoughts to share about the Godzilla comics from IDW Publishing. As always, here in Portland we have a ton of great events going on. So if our fair city is accessible to you, you might enjoy the excellent local events listed below. And please don’t leave the site before you check out the amazing contest I’m kicking off today thanks to the sponsor, Impact Merchandising! This could be your chance to fill your closet or dresser with a whole lot of Godzilla shirts! The last thing I want to mention here, there’s something odd about this particular episode’s musical content: not a single one of the following songs heard in this show are symphonic pieces. I dunno… I find that very cool. Don’t forget that this month’s movie is Yog, The Space Monster and we’ll be watching that during the last week of the month, so make sure you email your thoughts, questions and reviews to me before September 24th and I’ll make sure to include them in the following episode. Also, make sure your email’s subject is “Daikaiju Discussion” so I don’t miss it! Thanks again for being such great fans of the show – I’m looking forward to seeing what everyone comes up with for their contest submission. Talk to you later this month, folks!